Just few days after the official Philippine launched of the much talked about Flash Plus 2, there's GFXBench leak that shows a Flash branded phone with meaty specs. According benchmark test, it revealed that the device will be the Flash 3 that will sport a 4.6 inch screen, but will have a full HD resolution. Under the hood, it'll run with the extra powerful 2.3 GHz Helio X20 MT6797 deca core processor paired with Mali T880 GPU, 3 GB RAM and 32 GB internal storage. Could be a great powerful budget device for those who wanted a smaller phone for one handed use. This phone is also set to carry a 13 MP main camera, 8 MP selfie camera and will run on Android 6.0.1 Marshmallow OS. 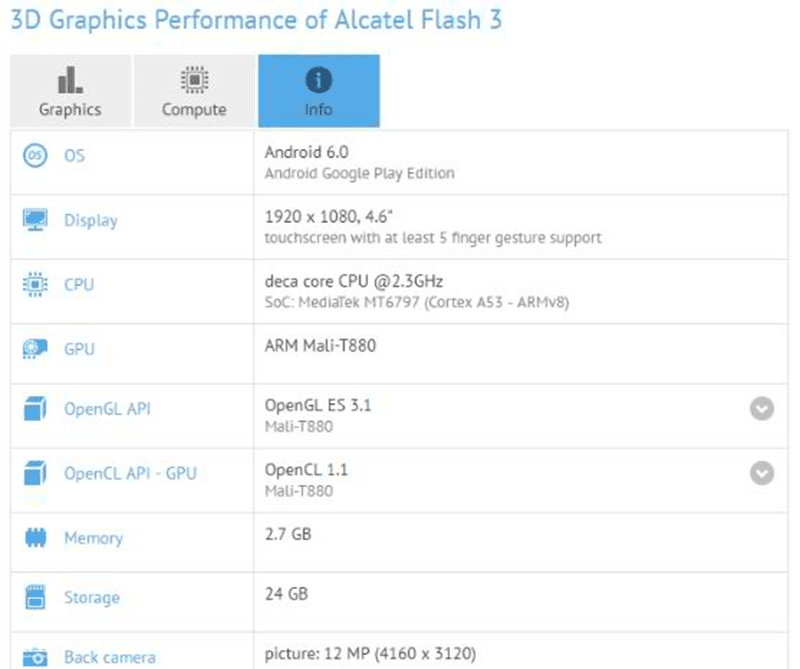 Related: Alcatel Flash 2 Quick Review, A Promising Budget Phone! While the GFXBenchmark showed us some of the key details, the rest of the specs and other information is unknown yet for now. This news is just good enough to keep us excited. Hopefully, just like what they do all the time, Flash will make this phone extra affordable for the specs and features.